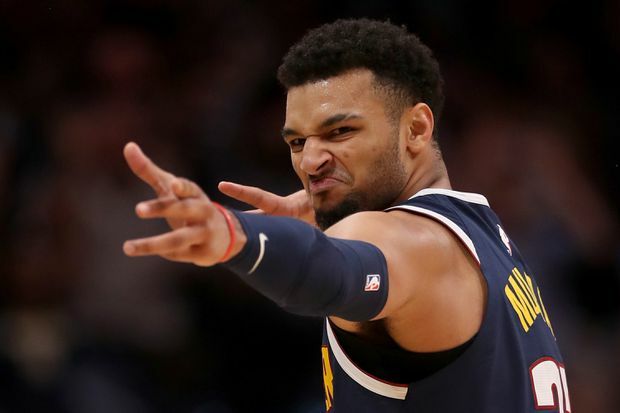 Jamal Murray celebrates a three-point basket against the Boston Celtics in the fourth quarter at the Pepsi Center on Nov. 5, 2018 in Denver, Colo.
Canada’s Jamal Murray simply got caught up in the moment when he hoisted a long shot with the clock winding down. Murray tied Steve Nash’s record for most points in a single game by a Canadian. Nash had 48 in a May 2005 playoff game. The most points by a Canadian in a single regular-season game was previously 47, by Andrew Wiggins on Nov. 13, 2016. Celtics: G Marcus Smart took an elbow to the back of the head from Nikola Jokic in the third quarter. ... F Marcus Morris drew a technical in the fourth for arguing a charging call. Nuggets: Murray scored 14 of the team’s 19 points in the first quarter. He finished with the most by a Nuggets player since Carmelo Anthony scored 50 on Feb. 7, 2011, against Houston. ... Despite some foul trouble, Jokic finished with eight points, 10 rebounds and eight assists. ... Gary Harris and Trey Lyles each added 13 points.